National Two North leaders Hull Ionians started off the new year in typical fashion, beating hosts Peterborough Lions 25-15. The first half belonged to the visitors after tries from full-back Sam Wilson and second-row Ed Falkingham helped them to a 17-0 lead. Peterborough scored two of their own in the second half to claw the gap back to five points, but Ben Whyte ensured the leaders would walk away with the victory eight minutes from time with a try out wide. Huddersfield kept their promotion aspirations alive with the added bonus of having a game in hand. 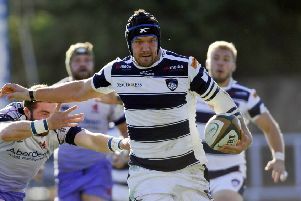 The Yorkshire side visited Preston Grasshoppers and came away 27-22 winners. Huddersfield led a cagey first-half 8-0 with their try coming from Lewis Workman out of the scrum, but Preston capitalised soon after the break, scoring from an intercepted pass. A string of penalties followed by two tries from Alex Battye and Kian Stewart secured Huddersfield’s 10th win of the season despite a spirited Preston fightback. Joe Rowntree came off of the bench to inspire hosts Otley to a last-gasp victory, beating Sedgley Park 28-26. Otley were 9-5 down at the interval but replacement Rowntree began chipping away at Sedgley Park’s lead with a try in the 50th minute and then again 15 minutes later. Sedgley Park got a try of their own but Rowntree provided the goods again with a penalty three minutes from time and Otley held on to take the full five points. Sheffield Tigers could not capitalise on a 12-point lead which would have seen them edge away from the relegation places, losing out by a mere point after South Leicester slotted home a penalty with two minutes to spare. The visitors started brightly with a try in the seventh minute before the South Yorkshire outfit crossed the line three times; two before the break from winger Jamie Broadley and full-back Peter Swatkins with flanker Kain Rix adding another after the break to give Tigers a 19-7 lead. South Leicester did not give up, kicking two out of three penalties in the last 15 minutes to edge the game 23-22. Hosts Wharfedale fell to third-placed Hinckley 33-20, slipping to fourth from bottom. The Greens were still in at the break at just 19-15 behind. Hinckley, though, restricted them to an unconverted try whilst crossing twice to further their lead, snapping a five-game losing streak on the road. Leaders Hull scraped a 16-14 win over Blaydon in North Premier league, while Harrogate ran in six tries on their way to a 36-25 win over Rossendale. Ilkley battled to a 31-17 win at Kirkby Lonsdale, while Sandal lost out 23-18 at home against Billingham. In North One East, there was a much-needed 31-22 victory for West Leeds over Percy Park, with tries coming from wingers Mark Calderwood and Alex Hughes as well as No 8 John Marshall. Leaders Scarborough were 29-19 winners at Cleckheaton, while second-placed Huddersfield YMCA edged a 34-31 victory over Bradford and Bingley.